Unfortunately, when the month of February rolls around and it’s time to start thinking about Valentine’s Day gifts, you may still be recovering from buying all of those holiday gifts. Yikes! This year, say “Happy Valentine’s Day” from the heart with an inexpensive yet heartfelt homemade Valentine’s Day gift. 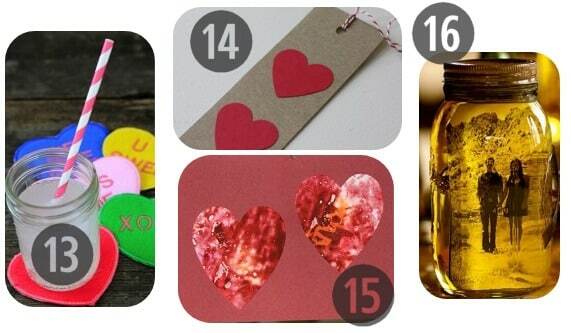 Here are 25 Homemade Valentine’s Day gifts to inspire you. 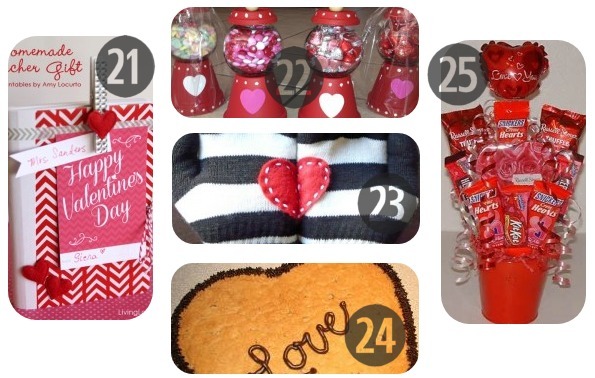 Follow my Homemade Valentine’s Day Gifts and Cards Pinterest board for additional ideas. 1. Spa in a Jar: Want to give your Valentine a day at the spa but can’t quite stretch your budget that far? Gift him or her this creative homemade Valentine’s Day gift of a spa day in a jar. Many of the “ingredients” can be picked up at your local grocery or drug store in the travel-size aisle for just a dollar or two. 2. 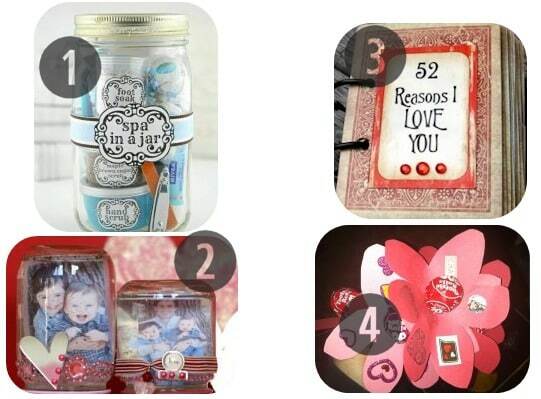 Valentines Baby Jar Snow Globes: This homemade Valentine’s Day gift is sure to tug at your Valentine’s heartstrings. Take a family picture or a picture of the little ones and make a snow globe. 3. 52 Reasons I Love You: Repurpose that old deck of playing cards in your junk drawer into one romantic homemade Valentine’s Day gift. 4. Lollipop Flower: This homemade Valentine’s Day gift is sweet to look at and eat. Bonus: They’re relatively easy and inexpensive to make requiring not much more than construction paper and lollipops. 5. Candy Cane Hearts: Have leftover candy canes from Christmas? 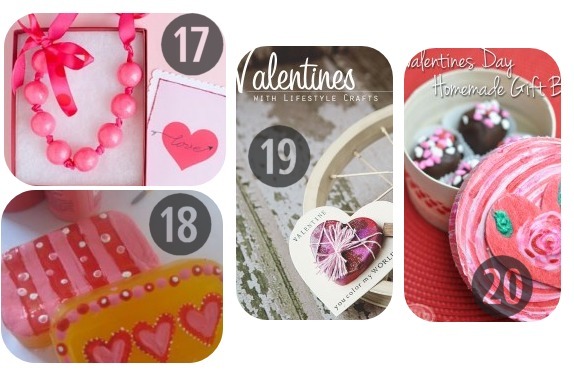 Create a minty homemade Valentine’s Day gift in the shape of a heart. 6. Heart Bracelets: What woman doesn’t want jewelry for Valentine’s Day? This year help your daughter make herself and her friends heart bracelets. This homemade Valentine’s Day gift is the perfect accessory for any outfit! 7. Bath Bombs: Okay, a “bath bomb” might sound like the incredible mess your little one makes in the tub when he or she gets a bit carried away playing; however, in reality, bath bombs make an awesome homemade Valentine’s Day gift. This gift will let your Valentine enjoy spa quality relaxation at home. 8. 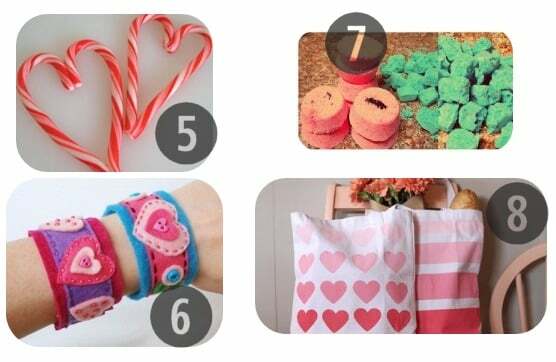 DIY Ombre Heart & Striped Canvas Totes: This Valentine’s Day, get carried away! Er, well, at least carry some stuff away in these great DIY canvas totes. 9. Mason Jar Recipes: Use one of these 25 mason jar recipes to craft an utterly delicious homemade Valentine’s Day gift. 10. A Sweet Treat for Teacher: Show the individual helping to shape your little one’s mind some love this Valentine’s Day with an out-of-the-box homemade Valentine’s Day gift. Head to the local dollar store to look for a plastic organizer like the one pictured here; a tackle organizer (for fishing) might also work. 11. Heart Rosette Valentines Wreath: Proclaim your love for the whole world to see with this homemade Valentine’s Day gift. Believe it or not this cute Valentine’s Day wreath can be made in just 3 easy steps. 12. Strawberry Heart Shaped Cupcakes: Mmmm – what says “Happy Valentine’s Day” better than heart shaped treats topped with icing? I can’t think of anything! 13. Handmade Drink Coasters: This homemade Valentine’s Day gift looks like the delicious sweethearts candy and even has sweet messages. 14. Cereal Box Bookmark: For your bookworm, this homemade Valentine’s Day gift is sure to be a favorite. This gift is easy to make so don’t feel intimidated if you aren’t super crafty. 15. Crayon Stained Glass Hearts: Repurpose old crayons to make this beautiful homemade Valentine’s Day gift that will look great in any room of the house. 16. Vintage Photo Mason Jars: Easily create a vintage looking homemade Valentine’s Day gift this year with just a mason jar, a cute photo of you and your Valentine, and some vegetable oil. This would make a great centerpiece for a home cooked candlelight dinner (hint, hint to all you hubbies out there!). 17. DIY Valentine’s Gumball Necklace: This homemade Valentine’s Day gift is too cute. These make great favors for a kids’ Valentine’s Day party. 18. Valentine Soaps: This Valentine’s Day, invite Cupid into every room of the house – even the bathroom! Follow these simple steps to create festive Valentine’s Day soaps. 19. Crayon Heart: This is another idea to repurpose those old or almost used up crayons. Melt crayons down into a heart shape to get this homemade Valentine’s Day gift. 20. Valentine’s Day Homemade Gift Box: Making this homemade Valentine’s Day gift is something your little one can help with. Pick up a plain wood or cardboard box at your local craft store (get the heart shaped one if they have it!) and then deck it out with some paint and Valentine’s Day bling. 21. Gift Card Holder/Note Pad Valentine’s Day Gift: This homemade Valentine’s Day gift is perfect for a teacher or a student. The note pad is great for, well, taking notes whether it be for Spanish 101 or a shopping list for the grocery store. The little pocket can be used to hold gift cards or coupons. 22. Homemade Gumball Machines: These homemade gumball machines can hold an assortment of candy and are perfect for your Valentine’s desk at the office for when he or she needs a little 3 o’clock pick-me-up. 23. Heart-in-Hand Gloves: This homemade Valentine’s Day gift is so cute I want to make a pair just for me! Keep those precious fingers warm during the cold winter months. 24. Heart Shaped Chocolate Chip Cookie: This homemade Valentine’s Day gift won’t last long! 25. 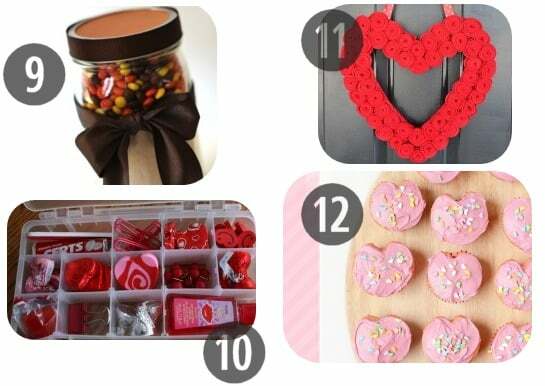 Candy Bouquet: Make your Valentine a homemade Valentine’s Day gift out of his or her favorite treats. If your Valentine is trying to lay off the sweets after all those holiday delicacies in December, replace the candy with healthier options like fruit and mixed nuts. 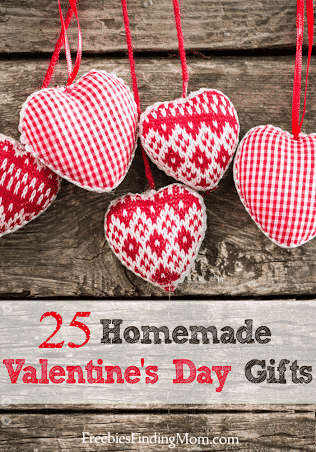 Which of these homemade Valentine’s Day gifts inspires you? Please share in the comments.